Currently there is no single ’origin of life’ theory, but several contradictory hypotheses. We do not even know exactly when life started. Possible outline is likely to be following: First prebiotic chemistry produces building blocks of life and then, at the presence of suitable energy source, these monomers build up self-replicating RNA-chains and other biological macromolecules. Finally first living cells are formed from the biomolecules. Still, different hypothesis do not agree of the order or in what conditions these steps happened and structures developed. At this time we do not quite understand how the live could once be formed from the non-living ingredients. But we do know how the current life is composed, and how it functions. A major problem is that the current life needs all its central parts for it functionality, and it is difficult to infer what parts could start functioning first, in absence of the other parts. Still, we can deduce something as based on the structure and function of contemporary life forms, and on the conditions of the early Earth. Different energy gradients, prevailing in the anoxic, volcanic environments were driving the formation of the Building blocks of life, i.e. the nucleotides (for the assembly of the RNA and DNA), amino acids (the components for proteins), and lipids (materials for forming membranes). These processes could have taken place e.g. inside the “white smoke” hydrothermal vents in the sea bottoms, or, at the water drainage systems of the volcanic fumarole fields and the craters. 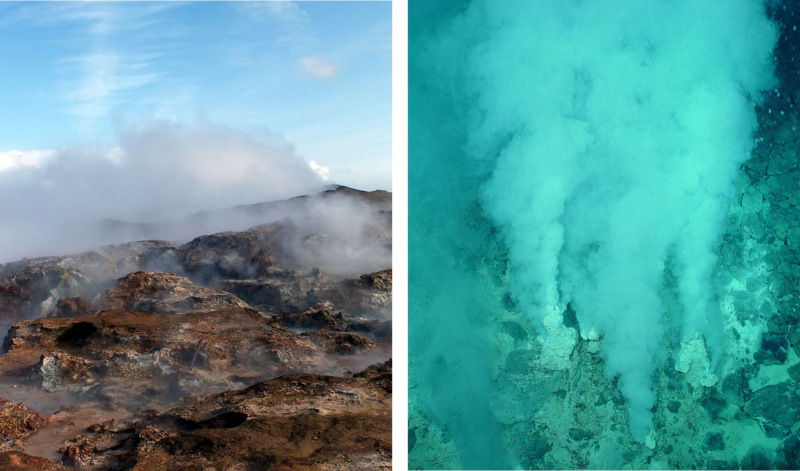 Organic precursor compounds, and temperature and pH gradients in the volcanic environments could maintain the synthesis of the building blocks. These compounds could arrive to these sits also as carried by the impacting meteorites. The building blocks of life polymerized into longer chains. Maybe also via multiple rearrangements and recombination events the ribonucleotides grew into short – and longer and longer – RNA strands. RNA strands can carry and transfer genetic information in the similar way as DNA does, and they act as catalysts simlarly to the proteins. 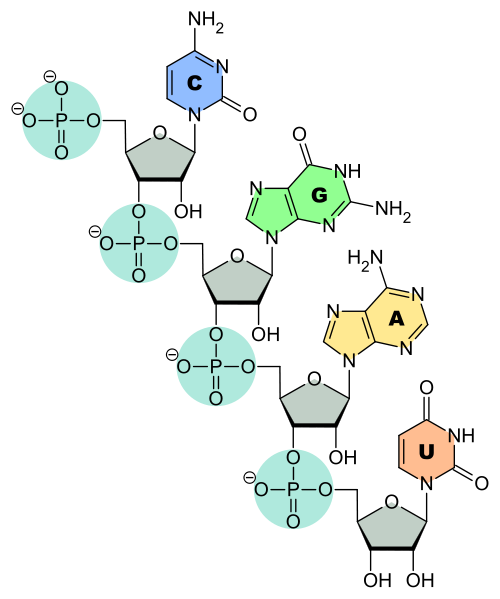 Some of these RNA-interacting systems became able to copy the original strands into their complements, and then again back into the original sequences. Thus, the strands had learned to replicate; the RNA world was born. But still, it is not known what other molecular components or functions were needed to sustain the RNA world. Many hypotheses do assume that that the replicating RNAs developed inside of primitive membrane vesicles (the protocells); others again assume that this early polymerization chemistry happened inside of mineral compartments or surfaces, and that the proteins synthesis arose before the cell membranes developed. In any case, the replicating RNA strands evolved, as driven by the natural selection towards still longer and more versatile and complex forms. This produced a collaborative network of different molecules, which also produced the ability to make add amino acids to a growing peptide, according to the instructions coded in a template RNA. With this, the proteins synthesis machinery was started, leading way for the genetically encoded production of the proteins, or the nano machines of the life. After the cellular life had started, it could evolve to produce more and more of new proteins and their functions. At some point the – rather unstable – RNA was replaced by the more stable and durable DNA, which is more suitable for permanent information storage, and this allowed the development of large and complex genomes. Cells started to grow larger and to diversify. Finally, the original cell population, last universal common ancestor, divided into two domains of life, i.e. 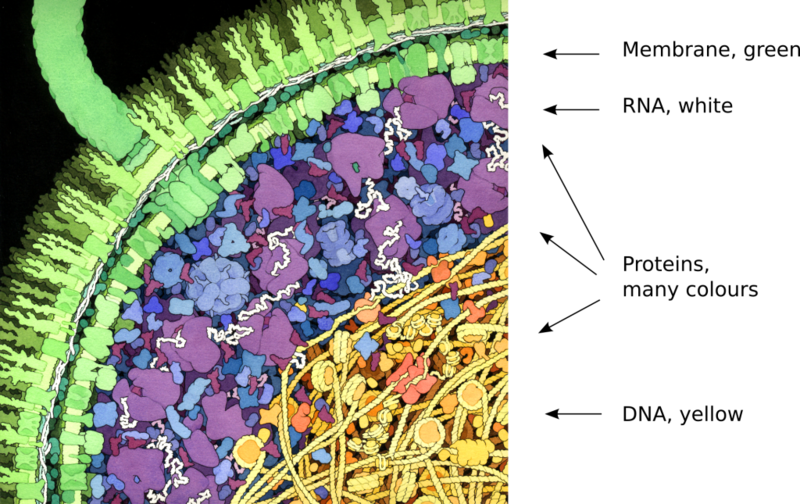 into the archaea, and the bacteria. 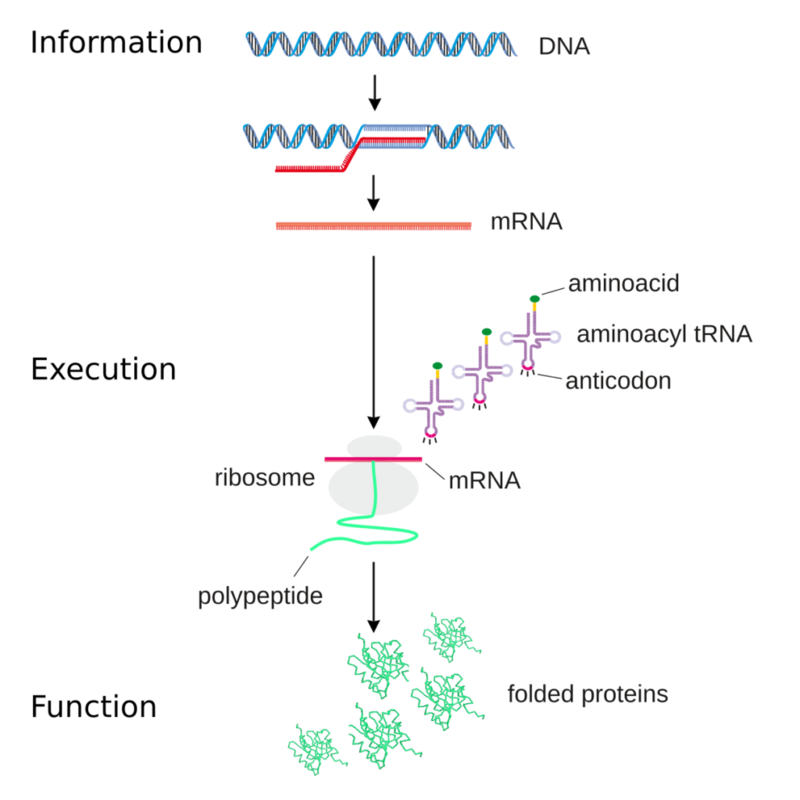 From information to function: Information is copied from DNA to RNA, and RNA is further used to manufacture proteins, nano machines of the life. For example hemoglobin, enzymes, antibodies and neurotransmitter receptors are proteins. Image: Kurt Ståhle.